I am taking my head out of the cookie jar for a minute to share a very yummy, and healthy dinner I made this evening. When it comes to Winter comfort foods I instantly revert back to my childhood favorites- chili (Mom was versatile, mixing it up with turkey chili, veggie chili and of course standard beef chili), Cheesy tuna noodle casserole, beef stew topped with fluffy dumplings, and green bean goop (family secret recipe, is MUCH tastier than name implies) just to name a few. Although my Mom’s Tuna casserole is nothing short of perfection, I wanted to put a healthier spin on this comfort classic. Doing a bit of standard Googling, I stumbled across Sarah Lynn Smile’s recipe for a Paleo version using cabbage as the noodles! We had basically everything in the cupboard, (had to borrow the nutritional yeast from my awesome neighbor) so I decided to give it a go. This was super easy to make, and so delicious! My picture does it no justice, but I promise it is wonderful. Here is Sarah’s Recipe, with my substitutions in parenthesis. I highly recommend doubling the recipe for the Magic Sauce, it is amazing! Would be great on any salad, dipping raw veggies, or as a sauce for roasted veggies or chicken. Prepare your cabbage and throw it in the oven. While that’s baking, heat your bacon fat in a skillet over medium-high heat. Add your veggies and sauté until cooked through. Remove from heat and set aside. 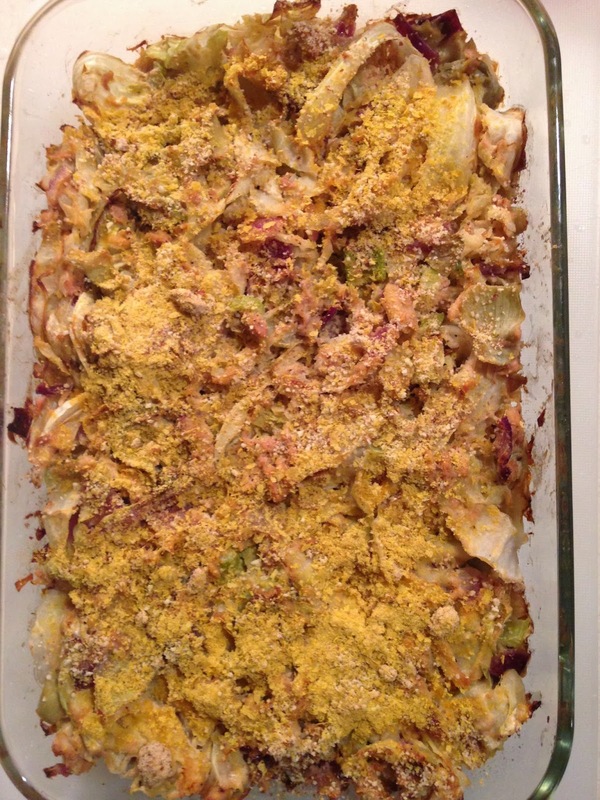 When your cabbage is done, reduce the oven to 350 degrees and prepare a 9×9 baking dish with olive oil or bacon grease. When your cabbage noodles are ready, combine all your ingredients in a large bowl and stir well. I add the olives last so they stay intact. Pour everything into your prepared baking dish and bake at 350 for 20 minutes or until it starts to brown on top. Thank you Sarah for such a light, yet surprisingly filling recipe!